Now that March is almost here, I'm watching the trees hopefully for the first signs of spring. The Fantasy Artists of Etsy is already celebrating the upcoming season change - Alison of Ethereal Earth spied several green creations growing in handmade shops. Featured spring gifts include woodland moss brass locket by Sihaya Designs, Green Man box by The Silver Branch and my peridot dragon print. Yes, some striking treasuries. My favorites are usually T's with combination of art & fashion. 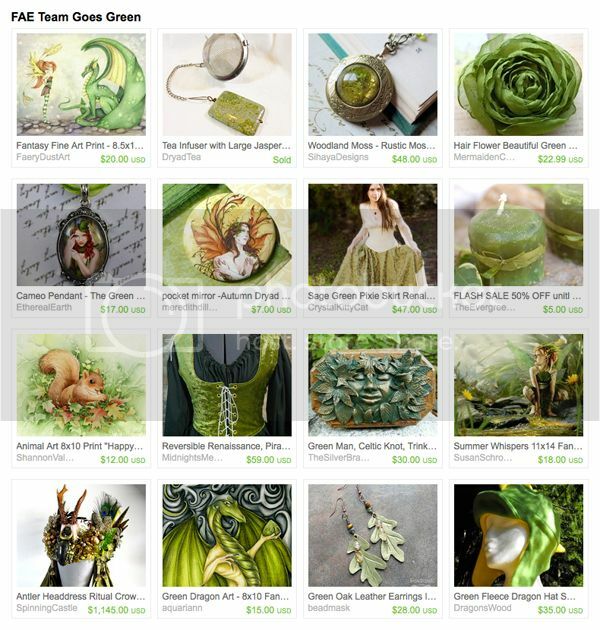 Awesome green treasury with wonderful finds. Love the lush green colors! Other green....the green in house, balance of energies..
Everything is so beautiful, I got lost visiting the lovely treasuries and their items. Thank you, Aquariann!